This technology is intended to promote the sustainable use of private vehicles. Car_Pooling TEC is an electronic device that enables the management and monitoring of passenger occupation in vehicles. To promote the shared use of vehicles through new technologies. To ease the shared trips logging by means of electronic logging via GPRS. 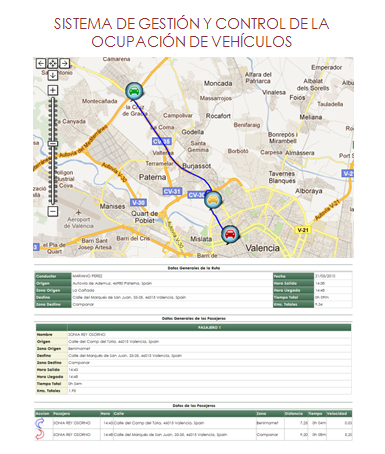 To facilitate the analysis of the trips by means of the GPS log of the routes. To provide the management agents with a shared use management technology to promote pricing, Access control, etc. Cities/City Councils: Restricted Areas Access Control, areas restricted to a minimum number of passengers, incentives application, etc. Interior facilities: public car parks, restricted parking, airports, etc. University campus, Colleges, Schools, etc. Companies, industrial areas, etc. that produce significant workers transit (industrial areas, storages, office buildings): access control, parking use monitoring, etc. Tolls, High Occupancy Vehicle Lanes. Taxis and public passenger transportation businesses. User Control: Car_Pooling TEC system is based on the GPRS communication of the route events in a vehicle (route, passengers getting in/out), and the subsequent analysis of the information by a web technology-based application. User identification by RFID card. GPRS Automatic data download system. Software and Web Application: the software is based on a Web Application that provides the control interface. Currently there are two versions that enable user and route control by means of RFID cards and of wireless connection (latest updated version).